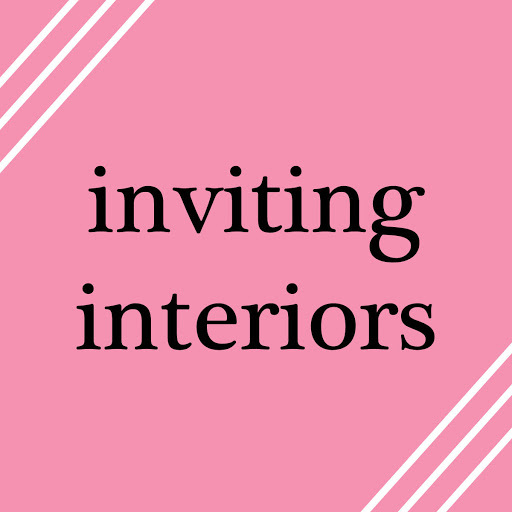 Introducing my newest segment… Inviting Interiors! Fun, inspiring interior design. I’ve always had a passion for interior design. Get ready for some jaw dropping, wish-inducing interiors! Today’s theme: Pops of Pink! I love these pink curtains! They are the perfect way to bring in some color, without going overboard. An entirely pink wall is probably a little bit more than a pop, but I love this look! 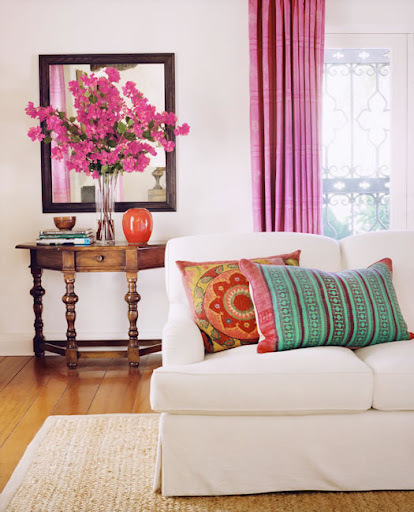 The patterned wall makes the bright pink not as harsh, and paired with white accents it really stands out. 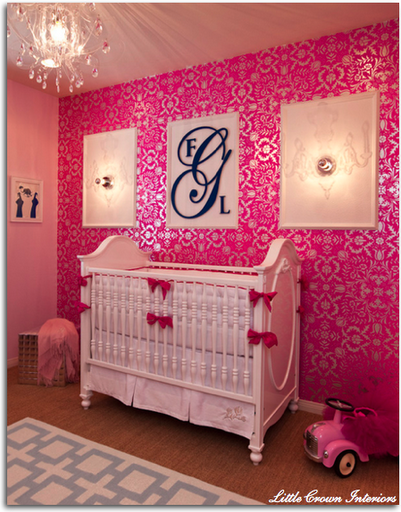 I also love the giant monogram on the wall, baby’s first monogram! At Dots corporate headquarters, the entryway features some lovely disco-esque dress forms. 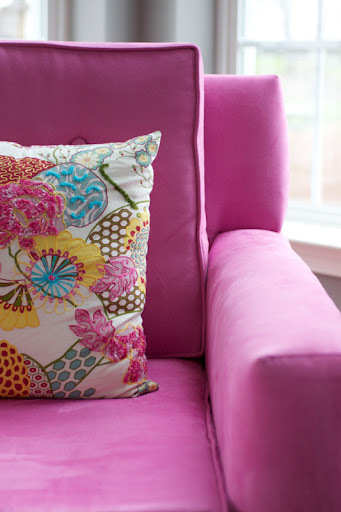 A bright pink dress form would be a fabulous addition to any aspiring fashion designer’s room! Scared of pink overload? Adding a vase of simple pink flowers is a great touch! Adding flowers to any room can help liven up the space and bring a small pop of color. I especially love how green the flowers are to bring in some of the green from the kitchen and the pillow. I am swooning over this chair! I’m absolutely in love! I can just imagine this chair paired with some lovely grey walls and a white sofa. Add a low, modern coffee table with some blue flowers and of course a coffee table book or two and you have a fabulously chic living room! Wallpaper is a simple way to bring pattern and color to any room! I love this damask pattern, mixed with white it brings just the right amount of bright color to the wooden table. Wallpaper can be a very sophisticated option for decorating with color. 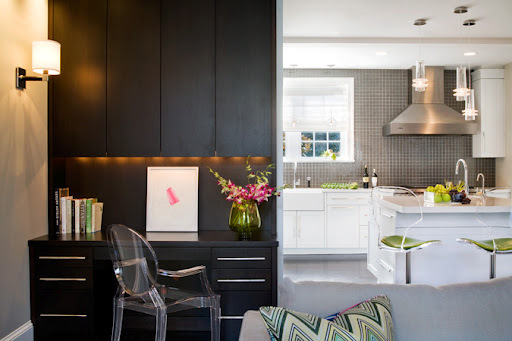 An unexpected source of color… a very small kitchen! I would have never thought of doing such a bright pink in a kitchen, especially for the counter tops, but I love this result. 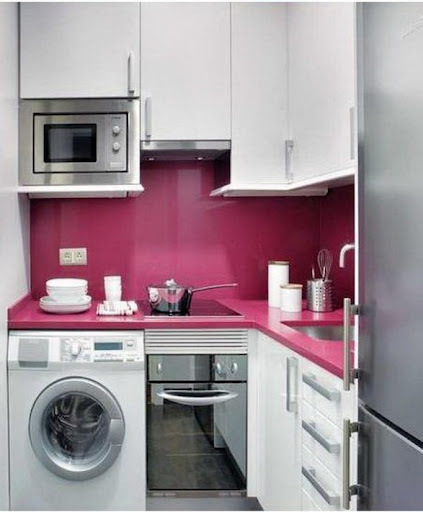 Maybe in a larger kitchen a pink backsplash could be used? Would you ever use pink in your kitchen? you should be an interior designer.